Apple Earnings Call Analysis: Amenity Viewer Draws 3 Key Insights to Apple's FY4Q18 Earnings - Trouble Ahead? We used Amenity Viewer to analyze Apple's FY4Q earnings call to identify 3 key insights and their underlying issues within a matter of minutes. The Amenity Score declined to 44 vs 58 the prior quarter, reaching its lowest level in 2018. 2. What Drove the Downtick? The balance of macro Headwinds vs Tailwinds stood out among Key Drivers with a negative sequential change. When we look at the specific comments from the call, Emerging Markets and FX fluctuations are common themes. "...we had an unprecedented number of products ramping, and while our ramps are going fairly well, we have uncertainty around supply and demand balance; and fourth, we also face some macroeconomic uncertainty, particularly in emerging markets." "The emerging markets that we're seeing pressure in our markets like Turkey, India, Brazil, Russia, these are markets where currencies have weakened over the recent period. In some cases, that resulted in us raising prices, and those markets are not growing the way we would like to see." "The App store in China, we have seen a slowdown or a moratorium to be more accurate on new game approvals. There is a new regulatory setup in China, and things are not moving the way they were moving previously...I think this is strictly a domestic issue in China." "And when we look at the impact of foreign exchange on our revenue for the December quarter, we're looking at 200 basis points of headwinds, which translate, given the size of our business, to almost $2 billion of headwind to our revenue." 3. What About Apple Pulling Future Unit Disclosure? Any time a company chooses to remove any disclosure to investors, it warrants attention. On Apples' FY4Q call, there was not a significant increase in the total number of comments in the Amenity deceptive language category. However, two of the eight overall were in response to a question on Apple's decision to withdraw future disclosure on units. Viewer quickly uncovers 3 key insights from Apple's earnings call. 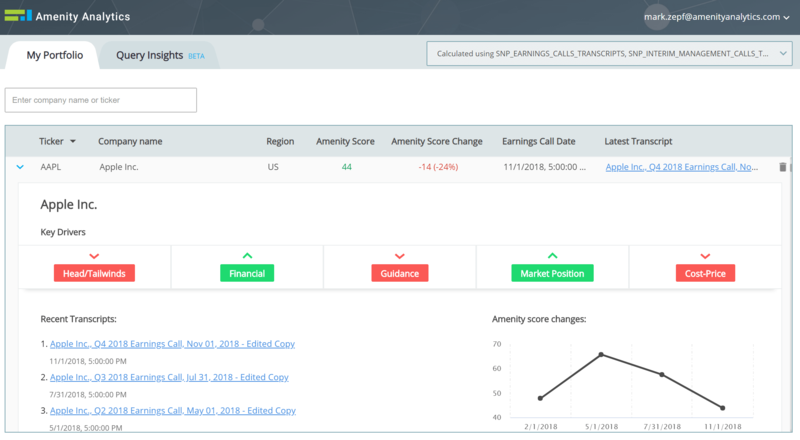 See how Amenity Viewer looks at the recent earnings transcripts to derive the underlying issues behind the negativity and potential pitfalls that lie ahead.